After three weeks, Steven is back on his feet, and just about everything has changed. When will Gomer2 be able to run again without almost fainting? And how does this affect their plans for the marathon? With only one week left before their second DTR/Re-evaulation, the Gomers are getting a little worried. But not too worried to stop talking about our biggest food weaknesses in the Listener Feedback, balancing work and workout in the Week in Review,two “new” songs in Songs To Run To, and ejecting Matt Lauer from a building in our brand new section, True Gomer Confessions. Monday Survey: After last week’s topic, we need to cleanse our pallets a little, so the Gomers are looking for your HEALTHY eating tips. What is your favorite healthy food? How do you fuel your long runs, and with what? We want to eat right, especially with the dreaded holidays approaching! Happy Running! oops i’m a gomer that previous comment was for epi-6 not 7!! Healthy food tip: peanut butter on whole wheat toast. Yum! But more importantly, it seems clear to me that what you two need to do is pick another marathon further in the future to train for. The doctor who said your training program should be in sync with your physical ability was right — especially after what happened in Detroit last week. hello gomers…you can pretty much eat anything you want…as long as its in moderation and as long as you excercise. my wife makes sure that there is at least one vege (except breakfast) and one fruit item in every meal. i know that this has nothing to do with this week’s podcast…but i just finished a triathlon in cincinnati. its the 2nd oldest triathlon in the country ! …and the beauty of this race is..instead of swim..you canoe! it was a fun and a very doable triathlon for you guys! and the best part..its a team thing…the race is made for teams of two! 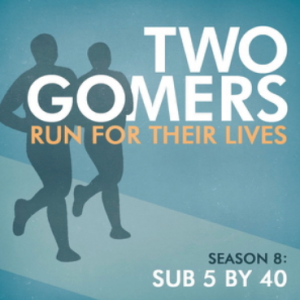 ….so next season..if there is a next season..will be two gomers “run” a triathlon ! it’ll be awesome ! its called the little miami triathlon…check it out! Gomers – I think its way too early for you to make a decision on the race. You’re still 14 weeks out. Stephen – your first run was a little tough, but I think you did great. It’s important for you to listen to your body at this point. Sounds like you might have pushed it a bit. One mile is a good achievement for someone who is still recovering from shingles! I would bet that you will get back up to speed quickly, but not right away. Give it a little more time. Now for the food stuff – Its pretty well known that one of the best health foods is chicken. You can cook several delicious, healthy ways. But, I really like fruits – grapes, strawberries, watermelon. Just a few more comments… Anthony – I don’t think you should feel bad about taking walk breaks, but 5 minutes is a bit long. I like to strategically walk. Sometimes I run 8 or 10 minutes and walk 2. I have found that I run tense and I need to walk just to relax my shoulder muscles and calves. Also, I average 6.5 mph at my natural stride. I find that its more difficult for me to slow down in order to pace myself on long runs (10 miles +), so its better for me to run naturally (or faster) then relax for a minute, and I still average 6 mph. I enjoy my runs much more too. Love the podcast! Happy running! Healthy foods – pumpkin, winter squash, and yams/sweet potatoes – with a little butter and/or brown sugar, can make a healthy dessert, and good fall/winter comfort food too. I try to eat salmon at least once a week. Oatmeal + fruit (berries, bananas) + coffee is a great way to fuel for my long runs. Don’t run for at least 30-60 minutes after eating. In New York City where there are usually around 5 restaurants on every block and the average kitchen is the size of an airport bathroom I’ve found it’s more realistic to find healthy meals to buy then make… my favorites.. salad bars, fruit salad, anything from Energy Kitchen or any of the low calorie meals from Fresh Direct. Favorite easy thing at home – Turkey Sausage! Just started listening to you two recently- love the podcast! my ultimate fav. healthy food has become my post-run ritual. I am a Weight-Watcher and I have been buying their smoothie mixes lately. I’ll add 3/4c. of milk and 1/2c. of frozen blueberries and whip it up in my blender- delish! I hope you both have a week of happy and healthy running! Smoothies are a big favorite of mine too. I especially love them with a good protein powder. BSN makes some really good ones, and Matrix Cookies & Cream protein powder is amazing. It almost can make a person forget about ice cream. Other staples I keep on hand: Oats (both steel cut and old fashioned), all kinds of fruit, boneless/skinless chicken breasts, salmon, turkey patties, tilapia filets, frozen fruits (great for smoothies), brown rice, red potatoes (particulalry if you don’t like sweet potatoes), quinoa, Ezekiel bread, peanut butter, almond butter, clif bars, eggs. Forgot to mention: Tons of veggies for salads, No-Name steaks and hamurger patties (red meat is the best source of highly-absorbable iron, and runners can tend to get anemic). Hey Gomers! Just listened to episode 7 running along the beach here in Melbourne, Australia, thanks for sharing the confessions. You two may have already made your decision, but I think you are right to listen to the doc and what your body is telling you.The true goal is to be able to keep running, not just doing this marathon. How about if you guys do the half marathon together in Arizona again and then shoot for a Spring marathon somewhere? That way you have a reason to train and you still get to see each other and have a great time in January. The more races you get under your belt, the more confident you will feel for a full marathon. A friend of mine has a great t-shirt that says “Running is my Prozac” Sums it all up, doesn’t it? I totally just flipped my new jar of all-natural peanut butter upside-down. I wanted to drop by and thank you. I have been listening to your podcast and just recently started listening to “last season” too. So after hearing what you all have been through I figured if you can do it, I can do it. I started running again today after a couple years being a couch potato and gaining a ton of weight. It sure is harder than it used to be – but I have also remembered how much fun it can be. I did a 2 mile run/walk today and have been feeling great ever since. So thanks for the inspiration. Just wanted to let you know that you have another listener here enjoying your podcasts. The fast food challenge was a great topic – I even mentioned that episode on my blog. Looking forward to your reveal!